Exhibitions held in the Royal Academy’s Sackler Wing have always been very impressive. My first exhibition at the RA was the J. W. Waterhouse: The Modern Pre-Raphaelite back in 2009, and since then the subsequent shows have hardly disappointed. Daumier (1808-1879): Visions of Paris continues this trend of high-quality monographic exhibitions, having previously exhibited works by John Singer Sargent, Johan Zoffany and Antoine Watteau in this perfectly-sized room. Featuring alongside a great selection of his satirical lithographs, Daumier’s drawings and paintings are given special importance, emphasising the artist’s preference as a painter rather than a caricaturist. A clay model of Jacques Lef’evre. Image via www.twitter.com. Honoré Daumier was famous in 19th century Paris for his caricatures of politicians and the bourgeoisie, featuring in newspapers such as La Caricature and Le Charivari. He also contributed to Le Boulevard where we see a lithograph of the French photographer Nadar – he was a balloonist who took the first aerial photograph of Paris and invented artificial photographic lighting while in the catacombs there. This amusing print is a commentary on the rise of commercial photographic studios, at a time when photography was beginning to flourish, and their claim to be considered high art. Commissions for painted portraits were under threat from these photographic ‘likeness’ and Daumier comments on this in another lithograph. He never drew from life or from models, working only from memory and an interest in phrenology. 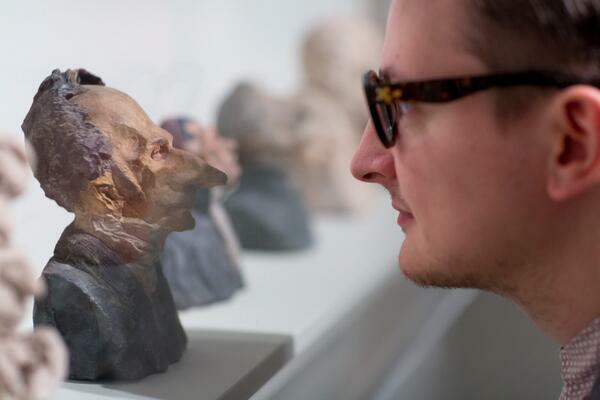 A set of clay busts on display, copies of the originals, could be seen as a basis for his caricatures, focusing on the prominent figures in the King of France Louis-Philippe’s government. 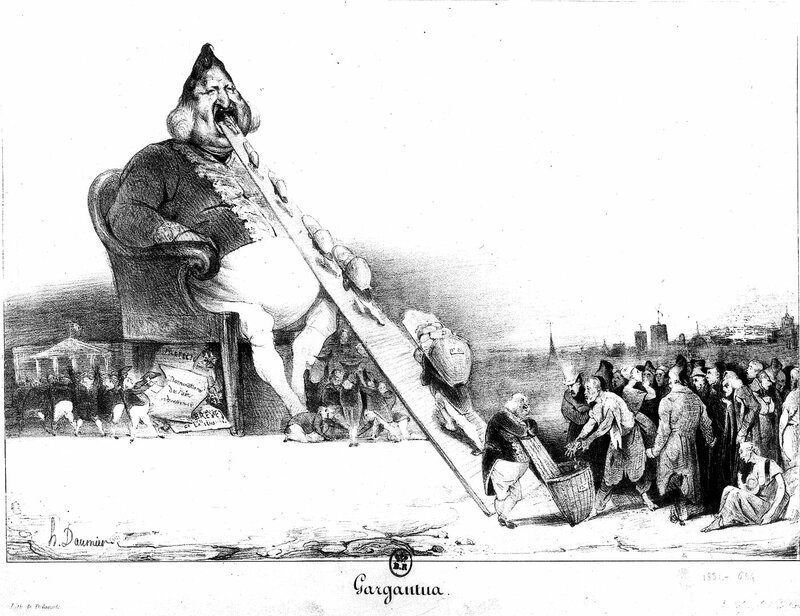 An unpublished Gargantua (16 December 1831) lithograph represents the King and his government in an allegory of excess and corruption, the King literally consuming the money of the poor and excreting bills and honours for his politicians. Honoré Daumier, Gargantua, 16 December 1831. Image via www.wikimedia.org. Halfway through his life, the 1848 Revolution saw the overthrowing of Louis-Philippe and the establishing of the Second Empire. The last cabinet of the ex-ministers (9 March 1848) allegorises the fall of the constitutional monarchy, depicting Marianne – the personification of Liberty and Reason – interrupting the final meeting of Louis-Philippe’s councillors, glowing in the backlit open doorway, wearing the Phrygian cap, or bonnet rouge, to signify freedom and the pursuit of liberty. 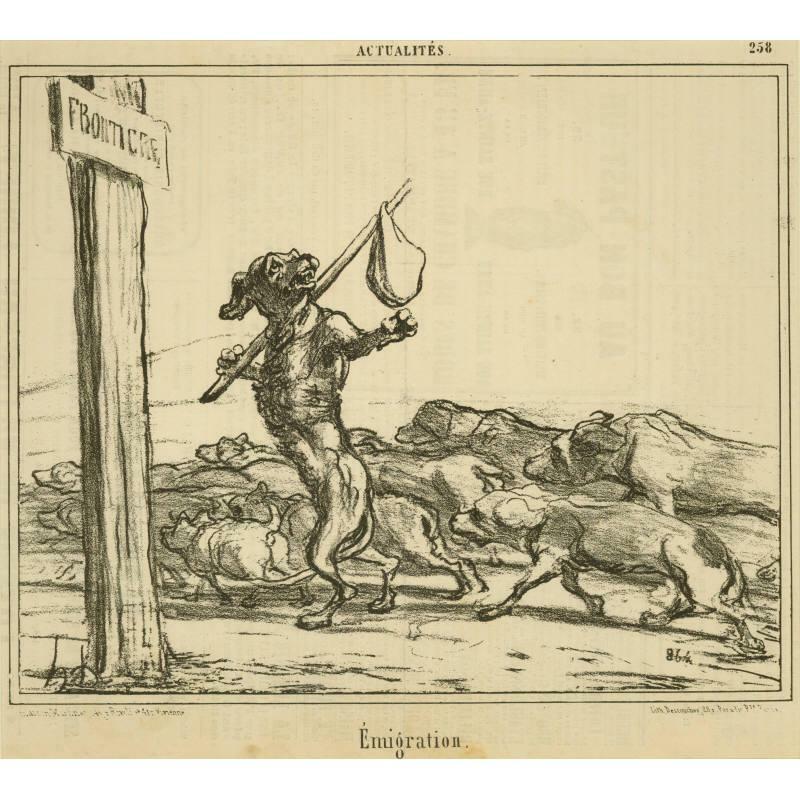 A hilarious lithograph entitled Emigration (12 January 1856) also depicts a dog protesting against the introduction of canine tax in 1855, while a bronze sculpture which caught the eye of the sculptor Alberto Giacometti depicts ‘Ratapoil’, an invented character symbolising the rise of Bonapartism. Honoré Daumier, Emigration, 12 January 1856. Image via www.libbymurphy.com. However, the political situation of France wasn’t always a theme in his lithographs. In Salon of 1857…Sad expression on the Sculpture placed in the middle of the Paintings (22 July 1857) a female sculpture bursts alive with frustration upon seeing herself ignored by the Salon audience, who are more interested in the paintings on the walls. 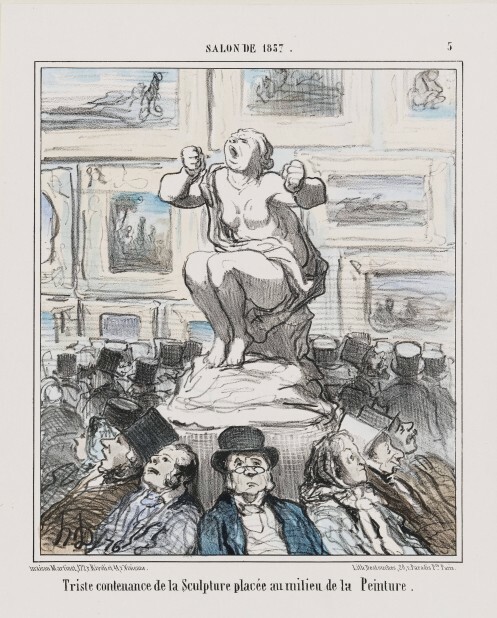 Daumier is commenting on the presentation of sculptures in the Paris Salon, often placed in cramped, dark spaces. In another, part of the Histoire ancienne series, the story of Pygmalion and Galatea is used to mock the favouring of an ideal person to the actual model, with the now alive marble sculpture resulting as an unfavourable woman who reaches for the snuff in Pygmalion’s hands. A particularly relevant lithograph to the whole of art history I felt was Landscape artist – The first copies nature, the second copies the first (12 May 1865), published in Le Charivari, which makes a very good point about the two types of artists – those who look to nature for inspiration, and those who delve on their predecessors and contemporaries. It is particularly relevant to academic art school practices where one would be required to copy from classical sculpture before elaborating on one’s own ideas. Honoré Daumier, In Salon of 1857…Sad expression on the Sculpture placed in the middle of the Paintings, 22 July 1857. Image via www.courtauld.co.uk. His paintings, on the other hand, take on a rather different style, as do his drawings. His style in the latter is usually characterised by sketchy, wavy lines superimposed on top of each other to suggest depth. 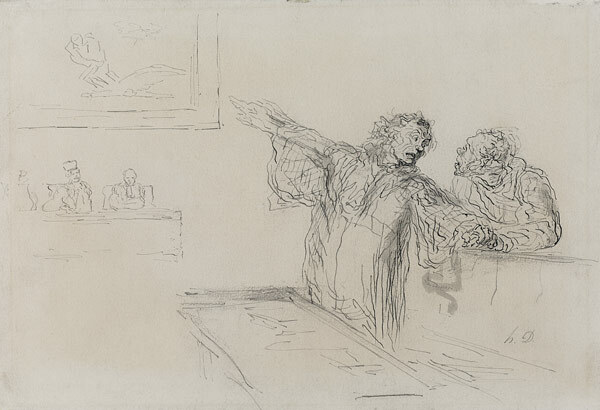 A preparatory pen and ink and watercolour The Defence (c. 1865) describes a defender in court pointing to a painting above the judges, which in the resulting painting is changed to a painting of a crucifix. But Daumier also had an appreciation for the Old Masters and classical subjects which he was familiar with in the Musée du Louvre. This is evident in his Fugitives (The Emigrants) series (c. 1850-52) where he depicts fleeing families following a cholera epidemic in his hometown of Marseilles in 1849. One of the drawings is very close in style to Old Master drawings, with the use of grey wash and pen and ink. A relief reminiscent of a classical frieze is also shown alongside this drawing, both with the same composition. Honoré Daumier, The Defence, c. 1865. Image via arthistorynewsreport.blogspot.com. As for his paintings, they could be seen as proto-Impressionist. The backgrounds are blurry and mirage-like, the figures usually have indistinct features, and the overall works have a backlit, contre-jour effect. 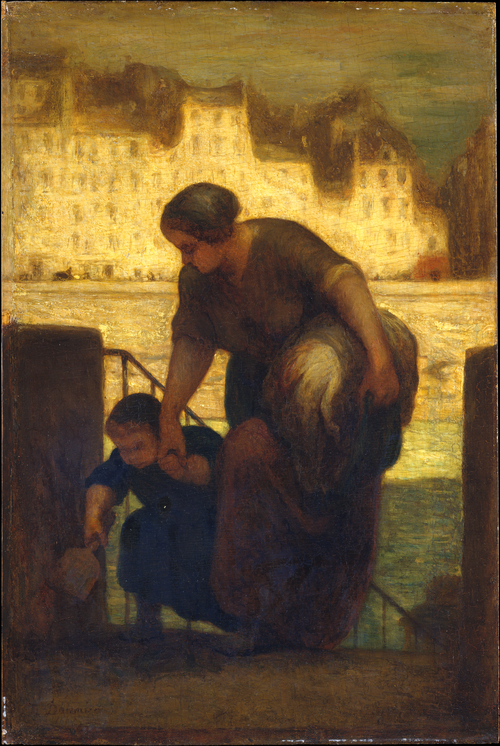 The Laundress (1861-63) embraces all of these characteristics, as well as being typical of one of his most prominent painted subjects, scenes of working-class life in Paris from when he lived on the top floor of 9 Quai d’Anjou. His mirage-like backgrounds are referred to as part of the ‘void’, an indistinguishable patch of visual space into which his subjects could project their thoughts into, such as the blank windows in Third-class Railway Carriage (1862-64). Honoré Daumier, The Laundress, 1861-63. Image via www.wikimedia.org. My favourite series of works in this exhibition draws on this contemplative mood, a set of three paintings, two watercolours, and one drawing. It begins with a Painter Leafing through a Portfolio of Drawings (c. 1850), developed into the guise of The Print Collector (L’Amateur d’estampes) (c. 1857-63) and finishing as The Connoisseur (c. 1860-65). We see three interrelated types of people separated by class. The amateur d’estampes was seen as a person of middle-class background, while the connoisseur was seen as a much wealthier individual. One could assume that the artist represented the working-class. The varying social classes in this series seem to be determined by the level of appreciation of art each individual draws their attention to. The artist looks upon his own drawings, hoping to sell them alongside his other contemporary works. The print collector ponders upon a red chalk drawing of a head of a female – one can assume it is by an Old Master – establishing his taste for this canon of great artists. As for the connoisseur, he lies back on an armchair, legs crossed, hands locked, and quietly contemplates a small-scale cast of the Venus de Milo (130-100 BC), one of the greatest masterpieces of Greek sculpture. The timeline goes back, moving further into the roots of art history. To truly appreciate art, one needs to understand the beginnings of art, and how each changing art movement influences the next in line. (Left to right) Honoré Daumier, Painter Leafing through a Portfolio of Drawings, c. 1850; The Print Collector (L’Amateur d’estampes), c. 1857-63; The Connoisseur, c. 1860-65. Images via www.wikipaintings.org; www.artobserved.com; www.metmuseum.org. During the latter half of his life, Daumier’s painting style branches off to experimentation. Some of his paintings remain soft and impressionist. Others take on his drawing style with the use of free, wavy brushstrokes, a style in which we now see in one of Daumier’s appreciators, Vincent van Gogh. Rather than impressionist, they are now expressionist. Woman with Child in Her Arms (c. 1847 or c. 1870) is very suggestive of graceful movement, as if the woman were one of the Three Graces caught in a beautiful dance. Sometimes we see this free style merged with his earlier style, such as in Two Sculptors (c. 1872 – 73). In many cases there is a focus on bold outlines. The Artist Facing his Work (c. 1860-63) reflects this, despite being unfinished, but the bold outlines are filled in to bring the forms out, just like one of his watercolours such as What a frightful spectacle (c. 1865). This unfinished painting also reveals his traditional working methods in which he uses a grid-like layout, used to enlarge the composition from a small pen and ink study. 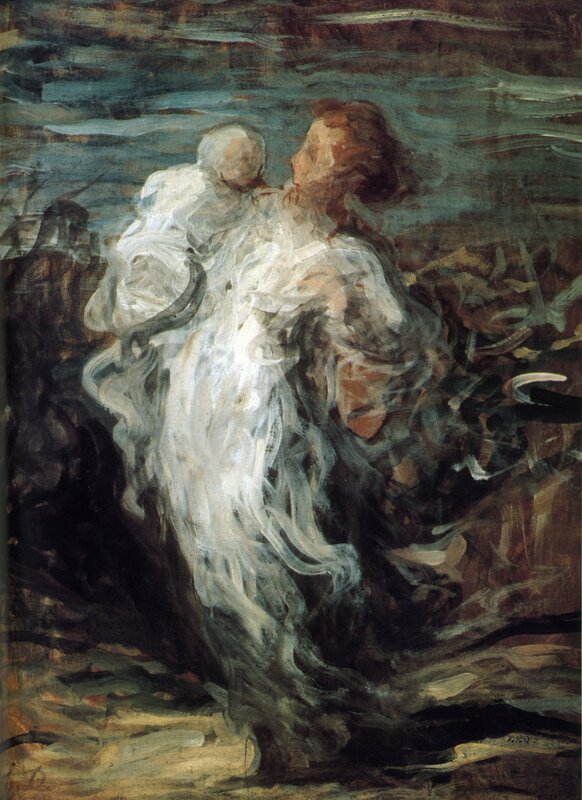 Honoré Daumier, Woman with Child in Her Arms, c. 1847 or c. 1870. Image via www.wikipaintings.org. Daumier’s influence on the subsequent Impressionists is evident in his free style – many of whom collected his prints, such as Edgar Degas with a collection of 750 – but his way of thinking about art seems to anticipate that of Pablo Picasso, especially with his depictions of the saltimbanques which isolates the circus drummer into the streets of Paris to stand as a metaphor for the caricaturist. The exhibition is very well curated and it is interesting to compare his medium-specific styles with each other. Aside from being satirical about the political situation of France, he was also very empathetic in his representations of the working-class, being an artist and caricaturist who was simply going with the times. Daumier (1808-1879): Visions of Paris runs until 26th January 2014 at the Royal Academy of Arts, London, www.royalacademy.org.uk.